This is a beautiful Claddagh Ring made from 10 Karat Gold. 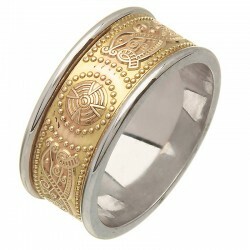 It has the classic features of Heart, ..
A beautiful Celtic Knot Ring in 10 Karat Gold - it is a fantastic example of the design and craftsma.. This is one of our favourite rings -the elegance of the simple lines is understated and pure. The.. This is a beautiful Claddagh Ring made in Ireland from 10 Karat Gold. It has the classic features.. This is a beautiful Claddagh Ring crafted from 10 Karat Gold here in Ireland. It has the classic ..
A Classic Irish Knot Ring! From the Sheelin Collection - the Intertwining Knots are a symbol of..
A Classic Irish Wedding Ring! From the Sheelin Collection - the Intertwining Knots are a symbol..
A Classic Irish Wedding or General Purpose Ring! From the Sheelin Collection - the Intertwining..
10 Karat Gold Rings made in Ireland by Fado Jewellery. Great range of Claddagh, Wedding and Engagement Rings - all Hallmarked by the Dublin Assay Office.